Home / Freebies / *Starbucks* Buy 1 Get 1 Free Holiday Drink! *Starbucks* Buy 1 Get 1 Free Holiday Drink! Woohoo! 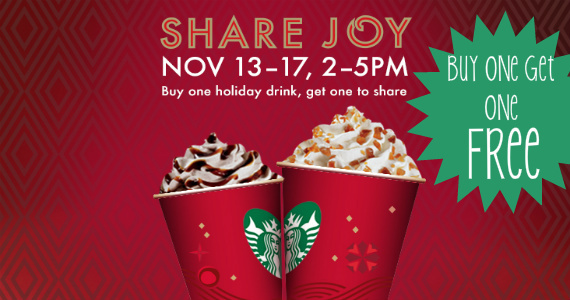 Starbucks is offering Buy 1, Get 1 FREE Holiday Drinks between 2pm & 5pm each day now until the 17th! Indulge in a creamy Caramel Brulée Latte, rediscover the minty magic of a Peppermint Mocha, try our new Gingerbread Latte recipe or savor our Eggnog Latte, beloved for more than 25 years. Previous post: *Hot Deal* Citrus Lane Box + Free Shipping!